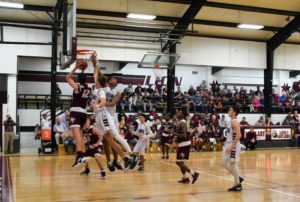 LOVELADY – For the 11th consecutive year, the Grapeland Sandies have clinched at least a share of the district title following their 66-53 win over the Lovelady Lions on Tuesday, Feb. 5. Cadarian Wiley splits three Lovelady defenders on his way to the basket during the second half of the Grapeland Sandies 66-53 win over the Lions. The last time Grapeland didn’t win at least a share of the district championship, George W. Bush was president and this year’s GHS graduating class was in first grade. The Sandies came into the game with a 9-0 record in District 20-2A and were ranked #5 in Class 2A. The Lovelady Lions were a game behind the Sandies with an 8-1 district record and were ranked at #19. A win by Grapeland would clinch the district title while a win by Lovelady would move them into first-place tie with the Sandies. 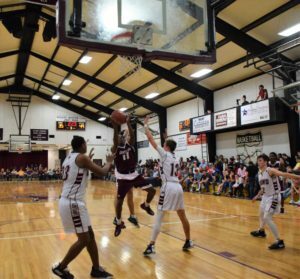 The first time these two teams played, it was a track meet as Grapeland outlasted Lovelady, 99-67. This time, however, the Sandies had to travel to the Lions’ Den, which is never an easy place for a visiting team. 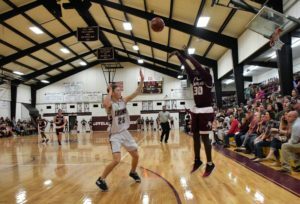 The track meet which began during January in Grapeland continued into February in Lovelady on Tuesday night as the Sandies raced out to a 19-12 lead after the first eight minutes of play. Rick Frauenberger is shown as he powers his way inside for two points. Keizion Ashford paced Grapeland with eight first quarter points. Rick Frauenberger had four, Deco Bryant hit a three while both Javion Joseph and Cadarian Wiley had two. The Lions were led by Chris McKnight with four points in the first quarter. TreVon Hawkins connected on a three-pointer, Michael Price along with Jay Thomas Robinson had two apiece while Timothy Johnson had one. The second period saw Josh “Bear” Ackley come off the bench for Grapeland and drop in six points. Tyrin Wiley had five while Bryant, C. Wiley and Keriaun Davis all had two. Rick Frauenberger chipped in one from the charity stripe as the Sandies took a 37-30 lead into the locker room at halftime. 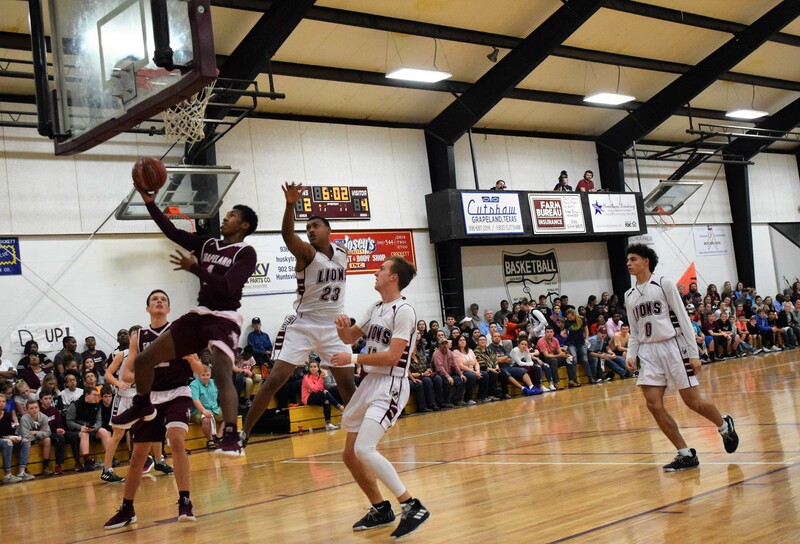 Lovelady’s second quarter points from T. Hawkins and Robinson with four apiece while five other Lions – McKnight, Price, Deontrae Hawkins, Logan Lowery and Seth Murray – all had two. After the break, C. Wiley began to heat up for Grapeland and poured in seven, third quarter points. Frauenberger powered his way to an additional four while both Bryant and Joseph connected from behind the arc. Grapeland’s Deco Bryant launches a three pointer during first half action of the Sandies’ 66-53 win over the Lovelady Lions. While the Sandies were heating up, the Lions shooting was cooling down. T. Hawkins paced Lovelady with five points, while Price hit a three and McKnight added a basket to make the score 54-40 with eight minutes remaining in the game. Down by 14, the Lions attempted to mount a comeback and managed to cut the lead down to nine. That was as close as they would get, however, as the Sandies defense held Lovelady to only 13 fourth quarter points. Murray led the way with five points while Robinson added four. Both D. Hawkins and T. Hawkins had two each. The Sandies were paced by Joseph with five and Bryant with four. Frauenberger added two and Ackley chipped in a free throw to help propel Grapeland to the 66-53 win. On the game, the Lions were led by TreVon Hawkins with 14 points and Jay Thomas Robinson with 10. Chris McKnight went for eight while both Seth Murray and Michael Price had seven apiece. Deontrae Hawkins added four, Logan Lowery had two and Timothy Johnson had one to close out the Lovelady scoring. The Sandies were led by four players in double figures. Deco Bryant paced Grapeland with 12 while both Rick Frauenberger and Cadarian Wiley had 11. Javion Joseph netted 10, Keizion Ashford dropped in eight, Josh Ackley worked his way inside for seven, Tyrin Wiley added five and Keriaun Davis chipped in two.